Sixteen hour days don't leave much time for creating movies to upload to my blog :-) Today we started with the delicious breakfast buffet at the Oasis Hotel before heading out to the pyramids and the Sphinx. 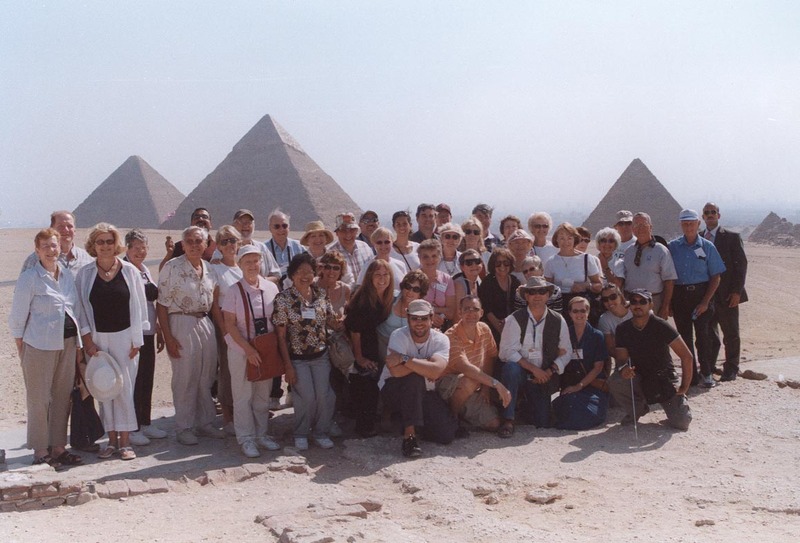 We viewed them from three perspectives: 1) up close at the largest pyramid, the pyramid of Cheops; 2) at a distance where we could see all of the three largest in perspective where we rode camels and took pictures; and, 3) at the Sphinx. Then to a Papyrus-making demonstration and a beautiful 3-story shop with many Egyptian items. After that we visited the oldest synagogue in Egypt where Moses was drawn from the Nile, then the oldest church built over the dwelling of the Holy Family. We then had lunch at the Al Fustat Restaurant & Cafe. After lunch we visited the site of the oldest Islamic mosque built in Africa where we had a brief explanation of Islam. Then an extensive tour of the Egyptian Museum. Here we saw biblical history alive before our eyes as well as many other things like the treasures of King Tut. We ended the day with a nice dinner and dance show on a ship cruising the Nile River.